Everyone loves a good underdog story and a team from Thoothukudi winning the inaugural Tamil Nadu Premier League looks like one. But when you have three Indian internationals and an U-19 World Cup star in your side in a domestic T20 tournament that only features cricketers registered in the state, it is hard to argue that. Yet, all you have to do is dig a little deeper and you will find that Albert TUTI Patriots' victory showcased what the team mentor Mrugang Monty Desai termed as "FAB" and overcame their fair share of adversities before they could take in the elixir of success. And just as Muralidharan wanted, the union of cricket and cinema ended in a blockbuster hit that will last long in the memory of the endearing cricket fans in the district, and the state as a whole. Winning the first and last match of the tournament may be the perfect way to start and end the tournament but their progression throughout the inaugural Tamil Nadu Premier League was anything but that. Not only did they have to overcome the loss of key players to the Duleep Trophy and the pain of losing three consecutive games but also play on through the death of the owner Albert Muralidharan's father to whom Karthik dedicated the win after the final. Yet, just like their name, which is a tribute to the numerous patriots and freedom fighters who came from the southern districts like Kattabomman, Bharathiyar, V.O. Chidambaram and Vaanjinathan, they fought till the bitter end and walked away with the trophy. And that fight and never-say-die attitude trickled down from the owner, whose father passed away during the tournament but still showed his support by coming to the final group game against Madurai Super Giants in Chennai, which his side had to win to qualify for the semi-final. Opener Abhinav Mukund captured that sentiment perfectly when he said: "I think whatever we have done on the field has shown what is happening off the field. DK (Dinesh Karthik) and I were missing during the initial part of the tournament; we had so much faith in our team after being on a losing streak but came back strong, so it’s amazing." While they got off to the perfect start by beating Chepauk Super Gillies, they lost the next three games and knew that they had to win their last three to have any chance of making it to the semi-final. 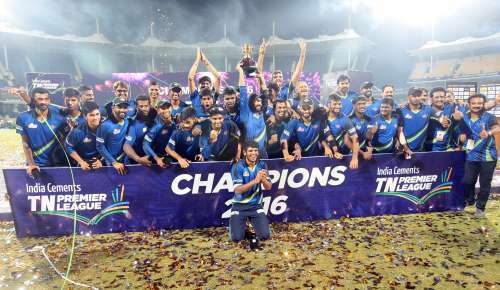 In the end, they finished with five wins in a row and claimed the maiden TNPL title. Team mentor Monty Desai described the feeling as a "significant moment" of his life and revealed what worked in their favor during a memorable experience for him. Even before the start of the tournament, the owner believed cricket is "the unexplored beauty of Tuticorin fosters team-spirit" and that was in evidence throughout the tournament as the team from Thoothukudi (Tuticorin) showed that consistency and team spirit was as important in their triumph as the hat-trick and fifties scored by individual players. 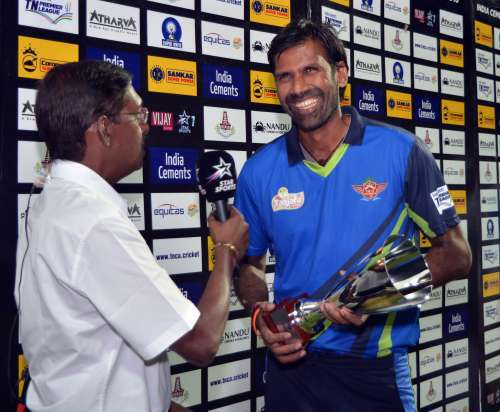 And that was exemplified by the spirit and endeavor shown by the team's senior statesman in Lakshmipathy Balaji, who came back for their fifth and must-win game with a Man of the Match performance to turn things around for his side. The former Indian fast bowler finished with figures of 5/18 and set in motion the momentum that would eventually lead them to the title. After the final, Balaji revealed why he played in the tournament and spoke about the game that turned the tide back in their favour. "This is what we set in the beginning. I thought of playing this tournament because first time Tamil Nadu is organizing such a league and I thought why not give it a try and win the tournament," he said. The 34-year-old, who recently announced his retirement from first-class cricket ahead of this year's Ranji Trophy, finished with 11 wickets in eight matches and his memorable catch to dismiss Vishal Vaidhya showed that he wasn't afraid to put it all on the line for his side. "Yes we can do it" may have been the mantra for the side without their top players as their owner said and togetherness was always evident but in the end, what helped them cross the finish line was the return of "top players", two Indian stars, who made all the difference at the business end of the tournament. When the game was there to be won in the semi-final and final, Dinesh Karthik and Abhinav Mukund both stepped up with the bat. While the captain scored a 48 and 55 in the semi and final, the opener went one better as he finished the tournament with 91 and 82* and more runs than all but six players despite playing only five matches in the tournament. The 26-year-old's incredible form even led his captain to remark that he "would be surprised if Abhinav Mukund doesn't get an IPL contract very soon". But for now at least, IPL contracts, chances of playing for the Tamil Nadu Ranji side or even playing for India will be put on the back seat as it is time for them rejoice their victory and drink in the adulation from the chalice of success.